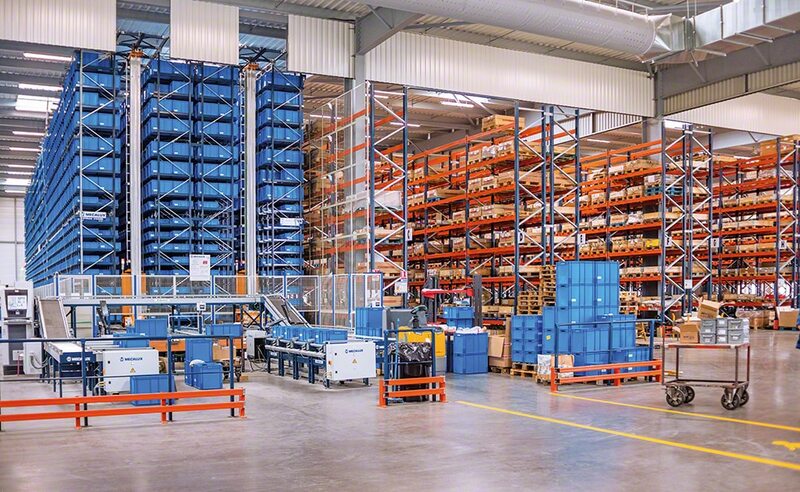 The new Grégoire-Besson logistics center, a French farm technology equipment company, consists of an AS/RS for boxes, pallet racking and cantilever racking by Mecalux. The combination of these three storage systems lets merchandise be organized according to its characteristics and demand, streamlining order picking tremendously. For almost 200 years, Grégoire-Besson has led French production of agricultural equipment designed to optimize the natural resources the land produces. The company enjoys a substantial business presence internationally and owns production centers in France, Germany and Italy. Its machines are outstanding because they are innovative, efficient, heavy-duty and adaptable to the layout of any sort of farmland. In recent years, the business has undergone tremendous growth, forcing it to build a new 1.1 acre warehouse in the town of Germain sur Moine (France) where it could manage all the spare parts of the group. The best solution for the storage needs and the sizes, weights and classifications of the 10,000 SKUs that Grégoire-Besson works with came through using different storage systems. The products are set into the best storage system with their size and demand in mind. The new Grégoire-Besson warehouse sends out an average of 80 orders daily, put together from 260 product lines, and can whip up more than 100 orders a day during peak seasons. The cantilever racks are 16' high and comprise columns and cantilevered arms on which lengthy or over-sized unit loads are set. These components are easily configurable and can be readjusted to suit goods of varied heights and types at Grégoire-Besson, as well as future warehouse logistics requirements. The lower level includes mesh enclosed shelves, which make the structure more rigid. Packages and different sized pallets are deposited there. Both pallets and containers are stored in the pallet racks. These 25' high racks are noted for their versatility to adapt to a wide variety of SKUs of distinct sizes, turnovers and volumes, and for their capacity to store more than 4,400 pallets. Having direct access is crucial at Grégoire-Besson, since this provides high flexibility when managing goods and preparing orders. Operators crisscross the warehouse locating the SKUs for each order, as instructed by the Mecalux Easy WMS warehouse management system via a radiofrequency device. On lower levels, picking is carried out directly from the pallets and reserve products are deposited on upper levels —keeping merchandise available at all times. Despite being small-sized, the variety of products is also clearly seen in the AS/RS for boxes, where a total of 10,064 diverse sized boxes co-exist: 24" x 16" x 9.5" boxes on one side, and 24" x 16" x 16.5" ones on the other. The warehouse is composed of two aisles with double-deep racking on both sides that measures 154' long, 29' high and has 17 shelves. A miniload stacker crane runs through each aisle, inserting and extracting the goods in their locations automatically. These machines that run at a travel speed of 590 ft/min and 328 ft/min when raised, include an extraction system with telescopic forks that access the second position of each rack location. The frontal part of the warehouse is where a roller conveyor circuit is installed, which takes goods to the two picking stations. These comprise an order prep table with enough space to work with waves of four orders at a time. Next, the operators collect the products instructed by the WMS and place these in the correct box that will be sent to the consolidation area, located on one side of the warehouse. There is also a replenishment post located alongside the picking stations. Interlake Mecalux has implemented the Easy WMS warehouse management software in the Grégoire-Besson installation. It runs through an SQL Server database in a virtualized environment, thus optimizing the performance of hardware resources (data storage devices, processors, etc.). The WMS receives input orders from the ERP Sage. Once the goods are received, they are moved to the corresponding rack depending on the product type (boxed or palletized) and on the previously configured WMS rules and strategies for product locations. Boxes are placed on the floor, waiting to be inserted into the miniload system. Meanwhile, pallets are assigned a location in the pallet racks. Unlabeled goods are sent directly to the cantilever racks. Easy WMS receives output commands from the ERP Sage for dispatching the goods. Next, the WMS can create picking instructions for the AS/RS for boxes or ones for shipping out entire pallets from the pallet racks. Prepared goods, ready to be dispatched, are deposited in the consolidation areas or sent directly to the docks to be loaded onto the transportation vehicles. In one part of the consolidation area, an express orders station was enabled and, in another, ten stations for the remaining orders. Here they deposit pallets coming from the pallet racks that hold part of the order. Then, they complete this order with products from the miniload system. For the system, the orders are closed automatically when the requested goods have been loaded onto the truck. While it loads, the WMS checks that the different pallets of the same order are assigned to the same carrier. Easy WMS by Mecalux is in continuous communication with the Galileo control module by Mecalux, which commands the stacker cranes and conveyors to move, which in turn send boxes to picking stations or to the consolidation area. Efficient picking: Grégoire-Besson issues an average of 80 orders a day, all error free and meeting delivery deadlines. A system for each product type: the warehouse is equipped with three different storage systems that adapt to the sizes, weights and rotations of the 10,000 SKUs this French company works with. Prevent human errors: the technological capacity provided by the automated warehouse for boxes and the Easy WMS of Mecalux, besides boosting productivity, drastically reduce mistakes made by personnel during handpicking.